Montessori cultural material is devised to help children attain basic knowledge about biology, geography, history and science. 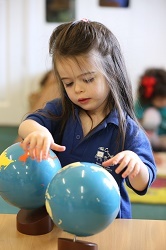 It is important that the child learns as early as possible about the real world, i.e. the natural environment and the man-made environment and is able to distinguish between them. Cultural studies help the child to form a systematic understanding about their surroundings and it also teaches to accept different ways of life lead by different people. The overall aim of the material is to spark child’s interest in new places and phenomena. Maria Montessori advocated a holistic approach to education, working from the general to the particular. The cultural studies of biology begin with a presentation the “sun game” introducing children the importance of the sun to the life on Earth and the inter-connectedness of all living things – plants, herbivores and carnivores. Life cycle and terminology puzzles offer an opportunity to learn some new vocabulary.